I love a boho wedding. It can be beachy. It can be rustic. It can take on a global feel, or it can transport the big event to the nearest high desert oasis. 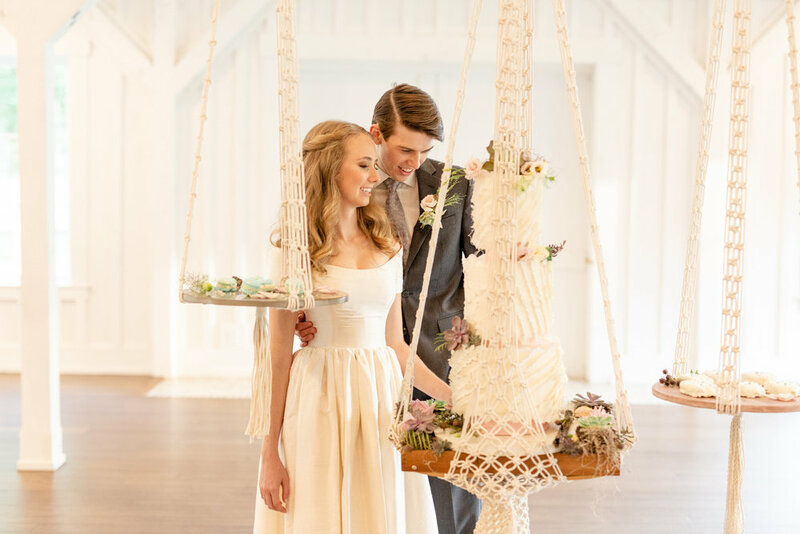 For this recent styled shoot with Malyn Made Weddings, photographed by Hanna Taylor Photography at Spain Ranch near Tulsa, OK, the light-and-airy boho wedding took on shades of sea glass and driftwood. Succulents adorned the bride's bouquet, the reception tables, and even the buttercream-frosted cake. Speaking of the cake: With the help of beautiful concrete by The Makerage and macrame by yours truly, the cake was gravity defying. Yes, really. A macrame wedding cake hanger. Plus desserts. Oh, what a way to play. And what a showstopping, unforgettable scene. I created each hanger using American-made, 100-percent cotton rope. I designed each piece not to be exactly like the others, but to sing in harmony together, and with the rest of what I knew about the wedding. Each hanger is roughly 8 feet long to hang from the tall rafters at Spain Ranch. How sweet are these treats on a slab of blush concrete by The Makerage. Treats by Sweet Devotions Cakery in Tulsa, OK. Stunning. Salted macaroons. Be still, my heart. The invitations and stationery, plus the place cards and seating charts, are all by Tulsa stationer/calligrapher duo Laurel & Marie. The driftwood. The wax stamp. The ribbon. The touch of sea glass. When one can't get to the beach, this suite is just as transporting. Florals by Robyn's Flower Garden. Gorgeous. Hair and makeup by Atherial Beauty. Hosting an event soon? I would love to make macrame for your special day. I have everything from large backdrops, canopies, and lanterns to bunting and, yes, wedding cake and dessert hangers available for custom order, as well as rental pieces. The best way to get started is to send me a message. I can't wait to add show-stopping, unforgettable, handmade moments to your big day. I love the welcoming warmth and texture of an oversized work of fiber art. I love how it feels to make it—working giant knots and super-sized stitches have made my hands and shoulders and soul stronger. I love the quiet power these massive creatures have in a space or a scene. If you ask me, the bigger the textile, the better the textile. If I have to climb a ladder to work on it, that's the ultimate. I love giant quilts and huge tapestries. I hang them on my walls just as anyone would with a work of art, since that's what they are. There's just something about mega macramé for me, though. It makes my imagination do double backflips. And I love how in decor, giant macrame work can read as boho, rustic, modern, and minimalist, all at the same time. These pieces aren't over-designed—when the knots are that big and the rope that heavy, there are just isn't room for frills or flourishes—and they highlight the simple beauty of knot and motif. Definitely read more about this heart-stopping space (and the giant macramé within). Have you been itching to try super-sized macramé? I'd love to be the first to encourage you to go for it. It's perfect for a beginner. It's quick (relatively!) to create large, show-stopping pieces. The rope smells divine. Honest. To me, a brand-new spool of cotton rope smells sweet and earthy, like fresh hay. If that aroma doesn't make your eyelashes flutter, then I just don't know. I have a giant-macramé kit to get you started making your own mega textiles. It comes with a large brass ring, printed instructions (with illustrated knot diagrams! ), and gobs of that sweet-smelling rope I mentioned—everything you need to create this 7-foot macramé hanging planter. Which would make you smile every day when you come home from work, whether it hangs in your living room or on that patio you've been working on. Hey: Did you know that subscribers to The Perch get 40% off any HSFN DIY kit, just for signing up? Including this giant macrame hanging-planter kit? It's true. The Perch is my weekly dispatch from my studio, delivered to your inbox each Wednesday. It comes complete with secrets, sales, and secret sales, and other little tidbits here and there—just like a bird would do. You can sign up here.